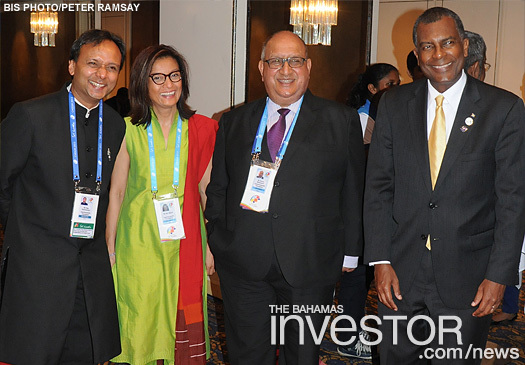 A large, high-ranking delegation from The Bahamas attended the Commonwealth Heads of Government Meeting (CHOGM) held in Colombo, Sri Lanka, November 15-17. Click here to see the delegation's full size official photo. 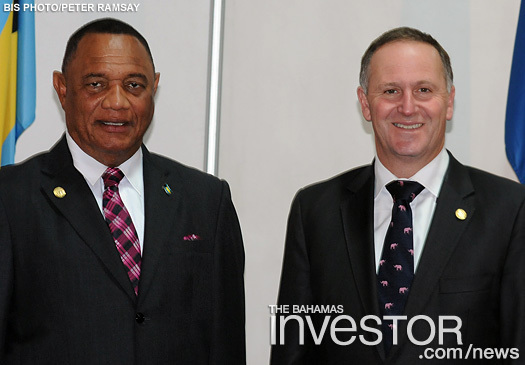 During the three-day forum, Prime Minister Perry Christie had a bilateral meeting with John Key, Prime Minister of New Zealand November 15. The two heads of government discussed a number of matters including the bilateral relationship between The Bahamas and New Zealand; the Commonwealth; and United Nations issues, including New Zealand’s campaign for the UN Security Council for the term 2015 to 2016. Prime Minister Christie advised the Prime Minister of New Zealand of the proposed implementation of value added tax (VAT) in The Bahamas and enquired of possibilities for cooperation between the two countries on this matter. Christie also thanked New Zealand for their pledge of support to The Bahamas’ candidature for re-election to the Council of the International Maritime Organization (IMO). The vote will take place in London November 29, 2013. Frederick Mitchell, Bahamas Minister of Foreign Affairs and Immigration, also participated in the Commonwealth Foreign Ministers Roundtable with Civil Society and Commonwealth Associated Organisations. Representatives from civil society conversed with Foreign Ministers on their perspectives for a Commonwealth Post-2015 development agenda and Minister Mitchell encouraged those Commonwealth Associated Organisations, specifically the Commonwealth Parliamentary Association (CPA) for further engagement and interaction with all people across the Commonwealth.